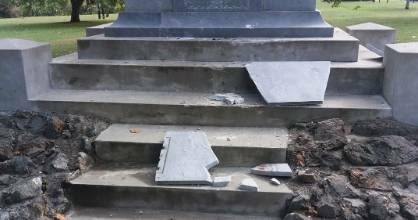 An attack on a small town's cenotaph has sparked outrage from Waikato's mayor. The winning ticket for Wednesday night's Lotto draw was sold online. Sri Lankan officials had a memo mentioning the Christchurch attacks 10 days before the Easter bombings. Three families tell their stories about their uncles who all died during World War II. An Auckland Airport spokeswoman said three domestic flights were returned from Wellington and six were cancelled. A person is seriously injured in Napier following a collision with a tree. Muslim hate crime victim overhears court workers mocking her about Christchurch terror attacks. Minister of Defence Ron Mark says he is "staggered" to know there is no up-to-date record of living veterans. The Duke of Cambridge will attend an Anzac service in Auckland before meeting with mosque attack victims in Christchurch. A pledge to crack down on extremist content online forever links Christchurch to positive change, its mayor says. Hanmer Springs veteran calls for more parents to bring their kids to dawn services, saying that's what makes the day so special. Willis St in Wellington has reopened after being in lockdown for just over an hour. Veteran rescue pilot says the Auckland Islands chopper crash survival story is among the best he's heard. Facebook quick to confirm it will send 'top exec' to summit hosted by Ardern and Emmanuel Macron in Paris. OPINION: The Christchurch Call is in the name of our city and we all have a responsibility to participate. A major schools-based initiative aims to keep students fit, healthy - and happy. Anne Frank never hid her emotions or how she felt about everything and that's pretty much a Māori approach to life, says Te Haumihiata Mason, who has translated her diary into te reo Māori. National List MP Jo Hayes is not ruling out going home to represent her people in Te Tai Hauauru, one of seven Māori electorates. ANALYSIS: The Māori ministers are yet to deliver much of anything for their people. Government takes "first step" towards normalising te reo's use in the education sector. A survivor of the Linwood mosque attack says he's unable to work due to mental trauma, and begs government to help with visas. Families of mosque shooting victims should get NZ residency, so none are forced to leave, says former minister. 'Strengthening trajectory' tipped for immigration. Forget her morbid lyrics, the star was clearly having a hell of a lot of fun at the Spark Arena. Massey University student Zakea Page designed the winning entry entitled "beauty in diversity". Several Wellington councillors ignore legal advice, push for residents' parking permit increase $50 more a year than recommended. They were meant to be back on the road 18 months ago, but Wellington's trolley buses are still idle. Helicopter crash survivor remembers a hole in the cloud, falling unconscious, and coming to in the Southern Ocean. A person was struck by a car in Rotorua. Road safety advocate said actions were "child neglect" and would have given the child no chance of survival in a crash. Investigation underway into why fire engulfed the Northland house twice in just 12 hours. A post mortem has indicated that a toddler found dead near Sullivan Lake probably drowned. A pou will be unveiled at one of Europe's most prominent battle sites to honour the Māori Battalion. Every day Ian McAlpine walks along New Plymouth's Coastal Walkway and watches hundreds of people blithely walk past the rubbish that litters the beach. The best efforts of a doctor, firefighter, police and two nurses were not enough to save a driver involved in a crash north of Taranaki. A man who deliberately lit two fires during Nelson's state of emergency in February has been sentenced to home detention. Planning for sea level rise and protecting high-value land are priorities in the latest round of Nelson and Tasman's Future Development Strategy. A three-car accident on Waimea Road has blocked one lane near the SPCA. Not sure if they should be "grieving or waiting", Jess Boyce's family cling to hope when things seem hopeless. The test is simple. Drop new bait in one area and old bait in another. Count the dead deer. "Salt-laden spray" off Cook Strait makes Sentinel Rock, half a hectare in size, the perfect place for some seabirds. Hardly any feedback on cycleway project with no shortage of critics prompts second round of consultation. About 300 people living at a Queenstown holiday park face homelessness when their cabins are removed to make way for a new development. A pair of Dunedin neighbours - one with reticulated water and the other without - have stopped sharing water after a dispute over a wedding venue. When the Wendon Church was demolished, the community needed somewhere new to hold its Anzac Day services. Te Anau councillor Ebel Kremer says the trio who survived a helicopter crash in the ocean 465kms south of Bluff are a credit to Southland.